With so many tempting side dishes (herbed stuffing?!) at Thanksgiving, the mashed potatoes often get over-looked. 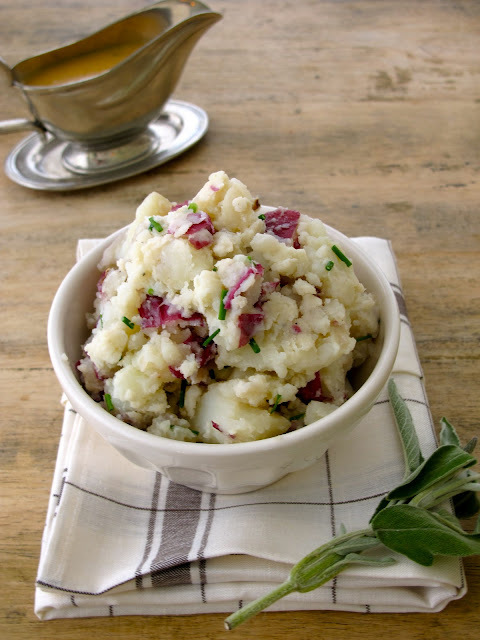 Add some texture and big flavor to your mashed potatoes by making these colorful and flavorful smashed potatoes - no bland looking or tasting potatoes here! For more Thanksgiving Recipes and my step-by-step Thanksgiving Timeline & Checklist, click here! In a large pot of water, add potatoes and about a tablespoon of sea salt. Boil until cooked through, or easily smashed with a fork - about 10-15 minutes. Drain off the water. You will need to mix and 'smash' them in two batches. In a kitchen aid mixer fitted with the dough hook, add half of the cream and butter. Add half of the potatoes a little at a time while mixing on low. Continue to mix for a couple of minutes until the potatoes have 'smashed' consistently. Salt & Pepper the potatoes to taste. Transfer them into a large oven proof baking dish. Repeat with the other half of cream, butter, potatoes, salt and pepper. Cover the potatoes with foil. If you need to keep them warm, put them in a 300 degree oven for 20 minutes. If you need to reheat them completely, put a couple of pieces of butter on the top, then put them in a 375 degree oven for 30-40 minutes.